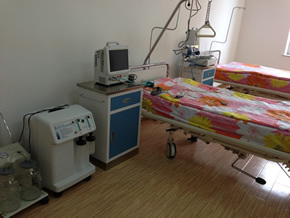 Beginning in 2009, land was donated by the government of Mongolia to Arjia Rinpoche for the purpose of building a facility for pediatric cancer care. 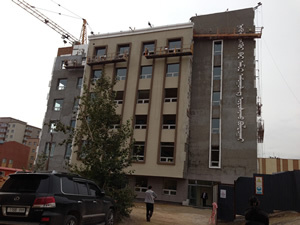 Generous donations from Rinpoche’s worldwide Sangha allowed breaking ground for construction of a five story, fifty room building in Ulaanbaatar. This facility will provide supportive medical care and lodging for patients and their families during the arduous treatment for their cancer. In September, 2013, upon completion of the exterior building, dedication of the facility and program was performed by Arjia Rinpoche. 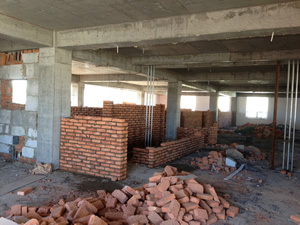 The interior remains to be finished and depending upon donations, it should be completed by September 2014. $1.3 million USD is needed to meet the deadline. 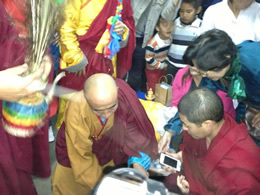 Let’s help Rinpoche bring this important and meaningful project to the finish line! Please donate generously as all donations go directly to the project. 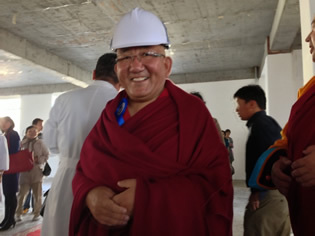 Arjia Rinpoche at the construction site. Interior of the hospital under construction ... and the finish line: a model patient room.